Technology has radically changed the way Filipinos live. Across the country, work, play, and communication are now heavily influenced by digital technologies. This influence transfers to learning as well. As more modern workplaces now demand digital skills, it becomes paramount for educators to prepare its students for a digital workplace. Clarissa Segismundo, education programs lead of Microsoft Philippines, explained the importance of digital tools in learning. “Engaging students remains one of the core pillars in the digital transformation of education. How they use technology is crucial in promoting collaboration, critical thinking, and problem-solving skills” said Segismundo. 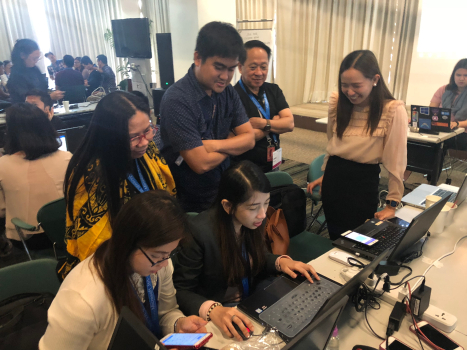 Through the Microsoft Education Ambassadors Program, Microsoft and UnionBank are working together to transform the educational landscape in the Philippines by equipping educators and students with the right skills. The program aims to empower schools, educators, and students with 21st century skills through the proper use of technology for teaching and learning. To date, there are over 1,000 Microsoft Education Ambassadors advocating teaching with technology in various parts of the country. “It is UnionBank’s mission and vision to stay grounded in its purpose of ‘Making a Difference’. And we hope to truly make a difference with Microsoft. It’s an exciting time as UnionBank employees open new doors of opportunities for the youth through technology,” said Henry Aguda, senior executive vice president and chief transformation officer of UnionBank. With extensive experience in the industry, UnionBank’s education ambassadors can share valuable insight into the demands and requirements of the modern workplace. It is the desire to impart knowledge and expertise to the country’s future workforce that led Michaela Rubio, SVP and HR director of UnionBank, to develop this program with Microsoft. “As Microsoft education ambassadors, UnionBank employees will serve as inspiration and valued resource persons for students and teachers. They possess the necessary expertise and skills to meet industry standards and can pass these on to the next generation,” she said. “At Microsoft, we recognize the value of our country’s young minds in shaping our future. By equipping them with work-ready skills with the support of our industry partners like UnionBank, we are paving the way towards employability and economic progress” added Segismundo. Middle managers are more likely to copy nasty habits if they sit close to their cruel chiefs, and less likely if they sit further ..